In the early hours of Saturday April 14, Britain joined forces with the missile attack on Syria and its capital Damascus led by the US and backed by France. The Prime Minister's use of the Royal Prerogative to launch the attack put an end to the 15-year old convention on seeking parliamentary approval for military action. Cross-party calls to recall parliament from its Easter recess, including from sections of her own party, were ignored. A number of senior Conservative MPs joined Labour Party leader Jeremy Corbyn, SNP leader in Westminster Ian Blackford and Liberal Democrat leader Vince Cable in calling for a parliamentary vote. Instead, Theresa May convened a special cabinet meeting, what was essentially a war cabinet, on Thursday. Later the following Monday, in proposing that parliament debate its role in the decision, Jeremy Corbyn labelled the attack "premeditated"; certainly by Thursday, talk of launching the action without parliamentary approval had become open. At the same time, to support forces based at Akrotiri in Cyprus and elsewhere in the region, a submarine was on its way armed with Tomahawk cruise missiles. In a press conference on Saturday morning, May said she took the decision "because I judge this action to be in Britain's national interest. 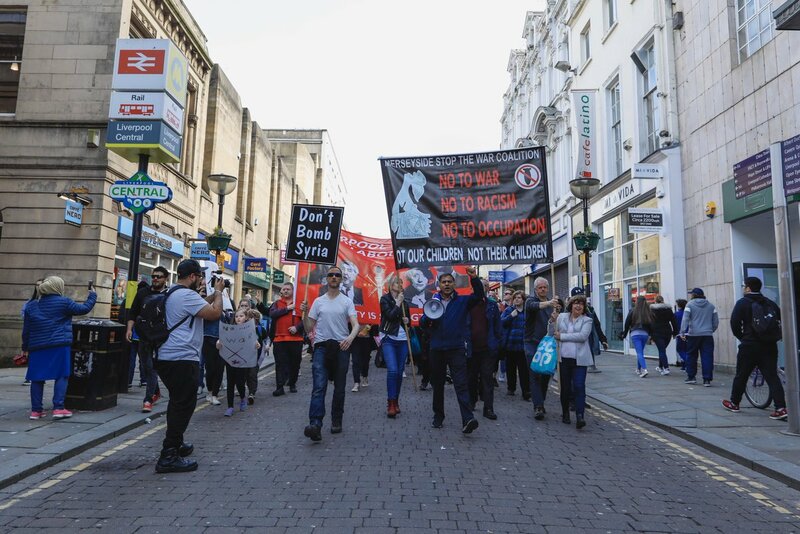 We cannot allow the use of chemical weapons to become normalised - within Syria, on the streets of the UK, or anywhere else in our world. We would have preferred an alternative path. But on this occasion there is none." The stress has been on presenting the strikes as precise and highly-limited, with the specific aim of responding to the alleged use of chemical weapons by the Syrian government against its own people on April 7. Yet her own words contain an implicit reference to Russia. The emphasis on her own judgement as leader and the assertion of "no alternative" form the justification for exercising arbitrary powers. 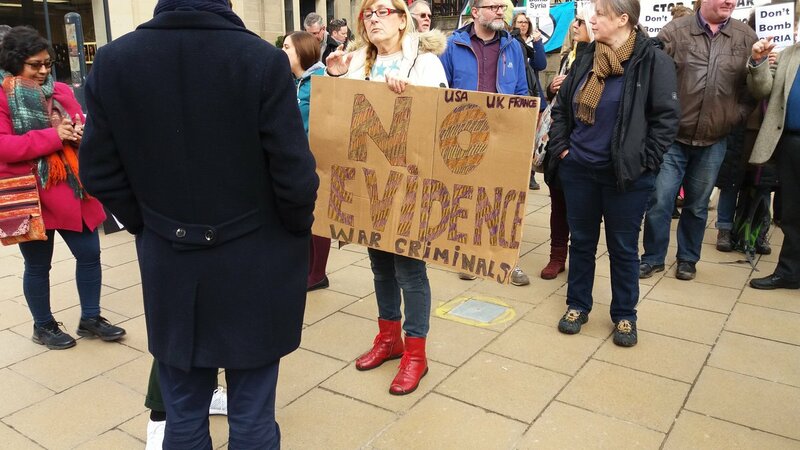 In the preceding week, Jeremy Corbyn had demanded proof, and stated that not only should May seek parliamentary backing but that no action should take place without a UN investigation. May for her part had simply said that "all the indications are that the Syrian regime was responsible". It is therefore significant that, despite the Syrian government's denial of the allegations and its request for an inspection by the Organisation for the Prohibition of Chemical Weapons, the attack was launched the day before this inspection was set to begin. "The deployment of the Armed Forces is currently a prerogative power. Parliament has no legally established role and the Government is under no legal obligation with respect to its conduct. In 2011 the Government acknowledged that a convention had emerged whereby the House of Commons would have the opportunity to debate the deployment of military forces, prior to doing so, except in the event of an emergency. The defeat of the Government in a vote on military action in Syria in August 2013 was widely viewed as an assertion of Parliamentary sovereignty on such matters. Yet many have argued that the convention lacks clarity and remains open to interpretation and exploitation. Indeed, the recent limited air strikes against the Syrian regime's chemical weapons capabilities have been undertaken without recourse to Parliament, with the Government justifying its actions on the basis of humanitarian need. The lack of Parliamentary consultation is sure to reignite the debate about formally legislating for Parliament's role in such matters. Despite having committed to legislating on this issue in 2011, the Government dropped its proposals in April 2016." "Members on all sides are therefore rightly concerned that no such approval was sought by the Government prior to the air strikes against Syrian Government installations, to which the UK was a party last Friday night, alongside the USA and France. Indeed, this House was not only denied a vote, but did not even have the opportunity to question the Government in advance on the legal and evidential basis for their participation in this action, on their new strategy in regard to Syrian intervention, or on why they acted before the conclusion of the ongoing inspection in Douma by the Organisation for the Prohibition of Chemical Weapons." Corbyn argued that the Prime Minister should be accountable to parliament, not to the President of the US, and that parliament must "assert its authority". In particular, he called for a new War Powers Act that would legally enshrine the convention that parliament be consulted on military action. But the issue cuts much deeper than that. The contradiction between the executive and the legislature, and over the question of where sovereignty lies, goes to the heart of British parliamentary democracy, where it is expressed in the notion that sovereignty lies with the so-called monarch-in-parliament. "Parliamentary sovereignty" is exposed as sham, and talk of "national security" a cover for upholding the primacy of the fictional person of state. Corbyn's call for parliamentary authority is aimed at the legislature's present subordination to the executive so highlighted by May's overturning of the war convention. In the current conditions, May's action is a declaration that: this is a government of police powers, not of laws. In other words, the police powers have come to have supremacy over statute laws not the other way round, and the operation of parliament to embody the exercise of those powers. The whole debate is framed in terms of parliamentary democracy, to attempt to reassert parliamentary sovereignty versus the attempt to marginalise it for reasons of expediency or "no alternative". But May's action is a plain statement that the old arrangements no longer operate. 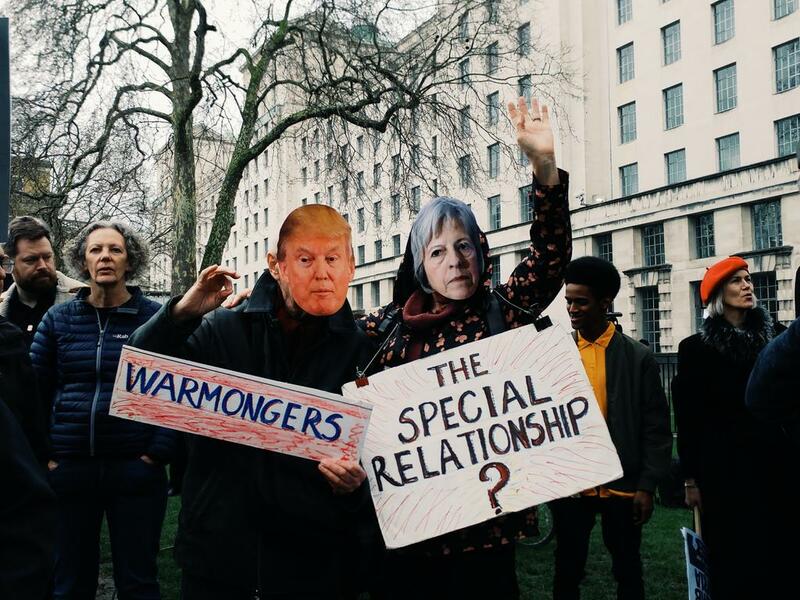 The call for a War Powers Act is one to further limit the scope of the Royal Prerogative, to stay the hand of the warmongers in using these prerogative powers. However, the Royal Prerogative itself needs to be eliminated, along with the defunct arrangements of party-dominated representative democracy that have been entirely usurped by powerful private competing interests. 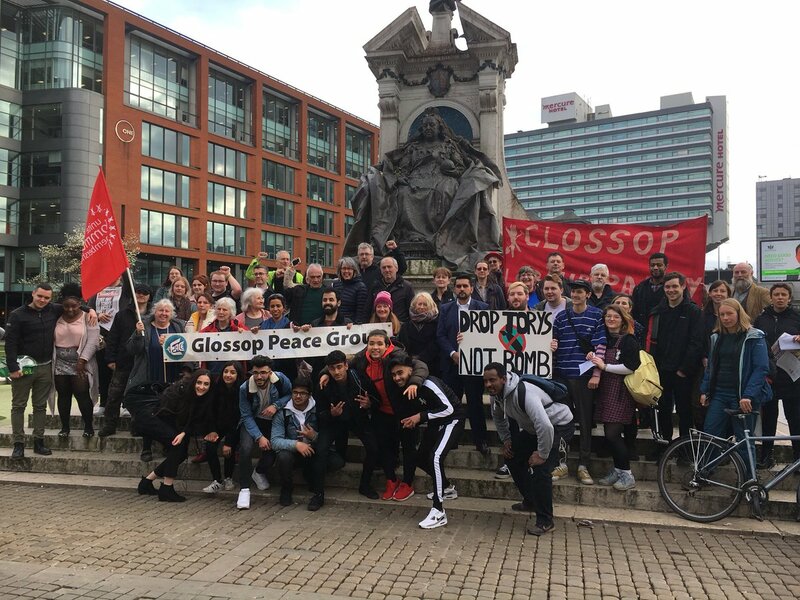 Instead, new arrangements that allow the popular will to be reflected in government need to be brought into being, as part and parcel of what is meant by anti-war government. The police powers of the state must be replaced by the power of the decision-making of the human beings that constitute the society, and the arrangements of governance must reflect this. The royal prerogative, according to the 19th century constitutional theorist Albert Dicey, is that "residue of discretionary or arbitrary authority, which at any given time is legally left in the hands of the crown". It can be said that these powers are unlimited and undefined. Claire Mills, "Parliamentary approval for military action", Commons Briefing papers CBP-7166, House of Commons Library, April 16, 2018. "In 2011 the Coalition Government suggested that, since 2003, a convention had emerged in Parliament that before troops were committed to military operations the House of Commons should have an opportunity to debate the matter. It also proposed to observe that Convention except when there was an emergency and such action would not be appropriate. "While the convention was broadly welcomed, there was some initial debate as to whether such a parliamentary convention could be said to exist. Between the Iraq vote in 2003 and the Government's observations in March 2011 there had been no Government-tabled debate, or vote, on any deployment of the Armed Forces, including the commitment of significant numbers of British forces to Helmand province in Afghanistan in 2006. Even the deployment of forces in Libya, which happened in concert with the Government's acknowledgement of the convention in March 2011, was not the subject of a prior parliamentary debate and vote, which led Professor Gavin Phillipson at Durham University to argue that Libya was 'not a fully satisfactory precedent' for parliamentary approval. "In a May 2011 report the Political and Constitutional Reform Committee called 'for greater clarity on Parliament's role in decisions to commit British forces to armed conflict abroad' and recommended that the Government work toward formalisation of the process, initially through the adoption of a parliamentary resolution, but with a view to the introduction of legislation in the longer term." "The Syria vote in 2013 was, and continues to be, viewed by many as a turning point in the debate on parliamentary approval. Commentators have argued that the defeat of the Government laid to rest doubts over the convention's existence and made the deployment of the Armed Forces without parliamentary approval, from a political perspective, virtually impossible in the future." Jeremy Corbyn, Military Action Overseas: Parliamentary Approval, Application for emergency debate (Standing Order No. 24), House of Commons, April 16, 2018.